The late nineteenth century was a golden age for European travel in the United States. For prosperous Europeans, a journey to America was a fresh alternative to the more familiar ‘Grand Tour’ of their own continent, promising encounters with a vast, wild landscape, and with people whose culture was similar enough to their own to be intelligible, yet different enough to be interesting. Their observations of America and its inhabitants provide a striking lens on this era of American history, and a fascinating glimpse into how the people of the past perceived one another. 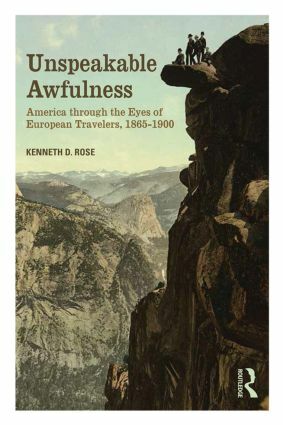 In Unspeakable Awfulness, Kenneth D. Rose gathers together a broad selection of the observations made by European travellers to the United States. European visitors remarked upon what they saw as a distinctly American approach to everything from class, politics, and race to language, food, and advertising. Their assessments of the ‘American character’ continue to echo today, and create a full portrait of late-nineteenth century America as seen through the eyes of its visitors. Including vivid travellers’ tales and plentiful illustrations, Unspeakable Awfulness is a rich resource that will be useful to students and appeal to anyone interested in travel history and narratives.